← Nearchus’ Journey Down the Indus: Eastern or Western Arm? The section I received was part of the Battle of Hastings. Before I go into what my panel is about, here’s a little background on the Battle of Hastings and why it was taking place. William, the Duke of Normandy, was fighting King Harold of England (Hicks 3). This fight between them was called the Battle of Hastings. My panel takes place right after the Norman troops thought that William was slayed. The man on the horse with the club in the air was William’s younger half-brother, Odo, who was a Bishop. 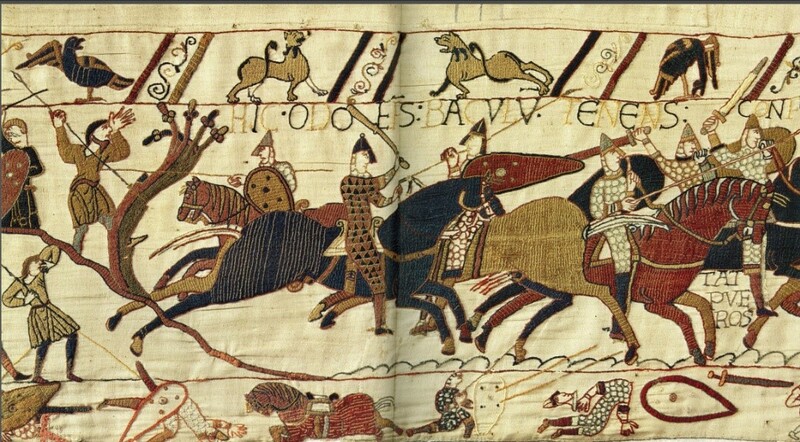 He has his club in the air and was trying to encourage the Norman troops to press forward; they didn’t want to go on because they thought William was dead. The Latin above this scene reads “Hic Odo Eps (Episcopus) Baculu(m) Tenens Confortat Pueros”, – which translates to “Here Odo the Bishop holding a club strengthens the boys,” (Wikipedia Contributors). It is important for history’s sake to know that Odo was a Bishop, and that he was holding a club. As a man of the church, he was not meant to have a blood-shedding weapon, such as a sword. However, he gets around this by brandishing a “baton of command” called a baculum (Wilson 194). It is noticed that all of the other warriors and soldiers are holding swords and long spears, but since he was a man of God and held a church calling, he was holding a club. It is also noticed that he is not wearing any sort of body armor in this scene, just a helmet. This gives more evidence to show that since he was a Bishop, he was not supposed to be engaged in any sort of fighting activity. The border below the middle scene is filled with dead and dismembered corpses, broken weapons, and even a dead horse. Showing the fallen soldiers of the war (Wilson 193). This panel gives a lot of historical evidence. It shows what the soldiers may have looked like when in battle, and also gives a good representation of what the Bishop and other religious leaders would have looked like (no armor, just a helmet), and why. Hicks, Carola. The Bayeux Tapestry: The Life Story of a Masterpiece. London: Random House, 2006. Print. Wikipedia contributors. “Odo, Earl of Kent.” Wikipedia, The Free Encyclopedia. Wikipedia, The Free Encyclopedia, 19 Mar. 2014. Web. 27 Mar. 2014. Wilson, David M. The Bayeux Tapestry. New York: Thames & Hudson Inc., 2004. Print.